They also announced that Tetsuya Nomura (FFVII and Kingdom Hearts) will be at their booth during the show with a chance to get an autograph by purchasing a qualifying Play Arts Kai figure. Read on to check out the video. Metal Gear series creator Hideo Kojima has tweeted out two new Metal Gear Solid Play Arts Kai previews. The preview pics give us new, in progress, looks at Punished Snake (aka Big Boss or Naked Snake) as well as Metal Gear Solid V’s Skull Face. These are both still work in progress sculpts, so many details can, and likely will, change before going into production. Last month, we posted a photo, courtesy of MGS creator Hideo Kojima, showing an in-progress Metal Gear Solid 5: The Phantom Pain – Punished Snake (aka Big Boss). 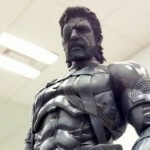 Square Enix has released a new in-progress pic of Punished Snake showing a more refined look and that it will indeed be part of the Play Arts Kai line. Read on to see the image. 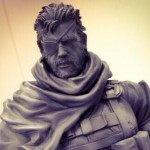 Hideo Kojima has tweeted out a couple of new pics for an upcoming figure. 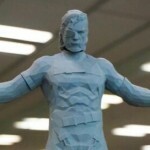 He’s working with Yoji Shinkawa on a Metal Gear Solid V: The Phantom Pain – Punished Snake (aka Big Boss) figure. The pic shows a 3D printed model, and he states that a lot of work still needs to be done. You can check out the images by reading on.